New York Gov. Andrew Cuomo (D.) on Sunday said he "didn't know" about a New York Democratic Party mailer labeling his progressive opponent Cynthia Nixon as someone who condones anti-Semitism, but a day before the campaign mailers surfaced, one of his top campaign aides pitched a story to the New York Post about her opposition to Israeli settlements. The campaign aide used an official "andrewcuomo.com" account and pitched the opposition research to the news outlet, saying they should run a story about Nixon’s support of the pro-Palestinian BDS–which stands for boycott, divestment, and sanctions–movement against Israel, according to the Post. "Nixon has supported insidious BDS campaign, signing onto letter boycotting Israel," the aide said. "Obviously something you guys have reported on a lot and right before the jewish high holidays! Can get you folks on the record slamming her as well." The email included multiple excerpts of news reports from 2010, detailing how Nixon was part of a group of approximately 200 American celebrities, including many Jews, who signed a letter advocating a boycott by Israeli actors, directors and playwrights of a new theater in Ariel, one of the largest Israeli settlements in the West Bank. Nixon's alleged support of the BDS movement was one of three bullet points used in a pro-Cuomo mailer that was sent out less than a week before Thursday's Democratic primary. 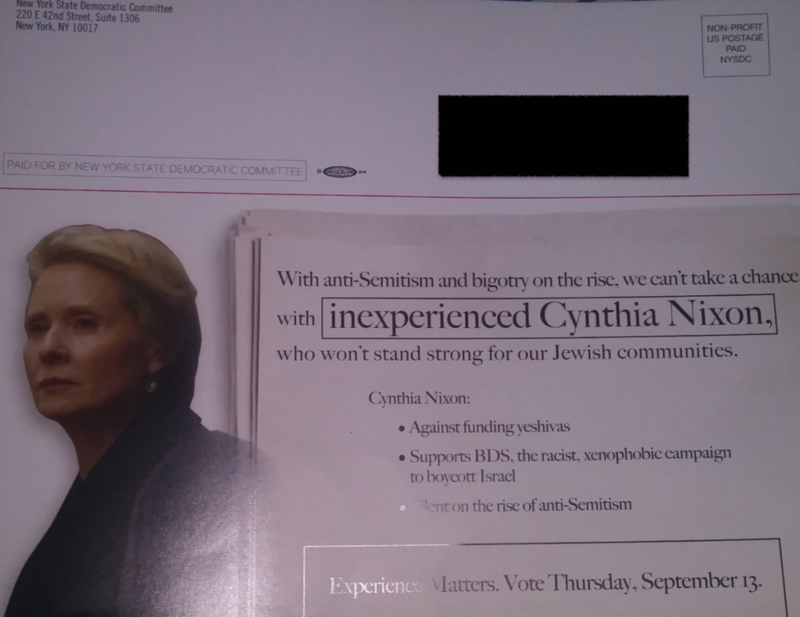 "With anti-Semitism and bigotry on the rise, we can’t take a chance with inexperienced Cynthia Nixon, who won’t stand strong for our Jewish communities," the mailer said. In addition to the email, the Cuomo aide attempted to pitch the reporter through text messages, including a text that said, "Hey I got something for you on nixon….I’m going to email to you. But not from me." 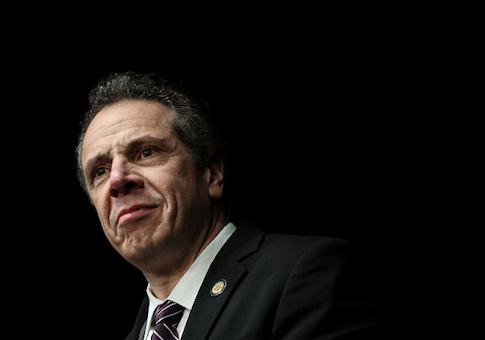 Despite the attempts to to have the Post publish the accusation, which is central to the Democratic Party mailer that targeted 7,000 households, Cuomo has vehemently denied he knew about the mailer. "I didn’t know about the mailer. I heard about the mailer. I haven’t seen the mailer," Cuomo said at an unrelated event in Manhattan. "The way I’ve ran this campaign, it’s been on the issues, it’s been positive. I think the mailer was a mistake. I think it was inappropriate." Cuomo followed up by saying he reached out to Democratic officials to "make sure it doesn’t happen again," and he repeated those comments again on Monday. Nixon shot back at Cuomo’s assertions, saying his claim to not know about the mailer was "patently absurd." "He’s the head of the Democratic Party. He controls the state committee," Nixon said. Cuomo's campaign said the "inappropriate" mailer was "wrong" and should not have gone out. Nevertheless, a former state Democratic Party chair said based on her experience there was "no way" the mailer was sent out without the "explicit consent" of Cuomo or his senior staff. Asked for comment about the Nixon-BDS story pitch, Cuomo's campaign press secretary Abbey Collins said: "The off the record email forwarded to the New York Post contained published articles and publicly available information on Cynthia Nixon’s positions on issues concerning Israel sent for the Post’s information — those articles have nothing to do with the wrong and inappropriate mail piece that went out and shouldn’t have." "It is apples and oranges, and to disclose an off the record exchange that had been agreed to by the New York Post is a violation of journalistic ethics," Collins added. But ex-Syracuse mayor and former state Democratic co-chair Stephanie Miner, who’s making an independent run for governor, on Tuesday described the campaign email and the party mailer as a "coordinated attack." "Based on my experience as state chair, there is no way that a mailer was designed and then sent out and paid for without the explicit consent of Andrew Cuomo or one of his top lieutenants," Miner said. This entry was posted in Politics and tagged 2018 Election, Andrew Cuomo, Cynthia Nixon, Israel, New York. Bookmark the permalink.